Here is some info about programs I have written and hardware I have developed for Atari XL/XE computers. A Linux kernel driver to handle the lowlevel SIO protocol on 16550 and 16C950 serial ports. atariserver - an Atari disk drive emulator, similar to SIO2PC or APE. At the moment atariserver supports up to 8 disk drives, up to 125 kbit/sec high speed SIO, and various tracing/debugging levels. AtariSIO requires a 2.2-5.x series Linux kernel (with enabled module support) and, if you want to use the optimized kernel driver, a serial port with a 16550 or 16C950 compatible chip. Since version 190111 atariserver and atarixfer also support serial port access via the standard Linux serial API. This means using the kernel driver is no longer mandatory and AtariSIO can also be used with USB SIO2PC interfaces or non-x86 systems like the Raspberry Pi. 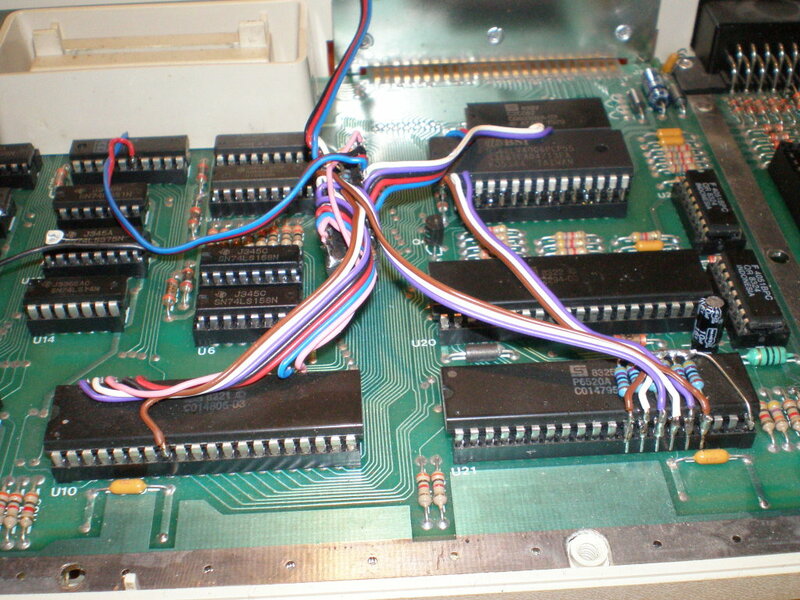 On x86 systems with a 16550/16C950 serial port it's still recommended to use the atarisio kernel driver as it offers more features and more precise timing. Since version 180508 the tools adir, dir2atr and ataricom can also be built on non-Linux posix systems (OSX, Cygwin, ...). See INSTALL-tools for details. Download the atarisio tarball and read the file README for usage and installation instructions. Here's the Changelog, if you are interested. dir2atr: Create an (optionally bootable) DOS 2.x/MyDOS ATR image from a directory on your PC. Includes MyPicoDos and support for creating MyPicoDos long filenames (PICONAME.TXT). adir: Print the DOS 2.x/MyDOS directory of an image. ataricom: "swiss army knife" for working with Atari executables (COM/EXE/XEX). List the blocks in a file, convert a COM file into raw data (and vice versa), merge/split blocks etc. Fixed allowed characters in MyDos mode. Added support for MyPicoDos autorun mode. Support user defined boot sectors, for example to create ATRs with xBIOS boot sectors. Ataridsk is a program for MSDOS-PCs that allows you to access Atari floppy disks in double density (180k). All you need is a PC (XT or 286 should be sufficient) and a 5.25" floppy drive. You can download ataridsk.zip here (22k). Please unzip the file and read ataridsk.doc for installation notes. The source code to AtariDsk is available here. Please note: You need TopSpeed Modula-2 V1.17 to compile the source. With WriteAtr you can write double density ATR-images to Atari floppy disks on your MSDOS-PC. You can also create ATR-images of double density floppy disks! All you need is a PC and a 5.25" and/or a 3.5" floppy drive. Version 0.92b added experimental support for the enhanced density (1040 sectors/128 bytes per sector) format. Please note: this format doesn't work with a lot of floppy controllers - use it at your own risk! V0.91 beta 2002-01-06 Attention - support for XF551 is currently broken! V0.92 2002-03-24 Attention: 720k XF551 mode does not work in this version! Unzip the file and read writeatr.doc for installation notes. MyPicoDos is a "gamedos" for the 8-bit Ataris that can read COM, EXE, BIN and BAS files. It's main feature is the ability to cope with the special MyDOS features like subdirectories and large disks (eg 3.5" HD disks). The current version supports all single and double density DOS 2.x and MyDOS formats from 720 up to 65535 sectors and can access D1: to D8:. Starting with version 3.0 MyPicoDos is GPL'ed and comes with the full source code in Atasm format. Only supports DD disks with more than 1023 sectors! MyIDE Tool is a program that provides direct access to harddrives in MyIDE format on your Linux/Windows PC. It will work with IDE harddrives, with Compactflash cards attached to either a CF-IDE adapter or to an (USB) cardreader and with images. You can easily write ATR images and MyIDE movies to your MyIDE drive, list the contents of your drive or back up your data to your PC. The current version V0.30 also supports Shawn Jefferson's MyIDE Image Manager. You can set the image category when writing (new) images to your disk, or quickly sort the image manager info (a lot faster than on your Atari). Note: you need to use version 4.1 or higher of the MyIDE Image Manager, older versions are not supported. Advanced moviewriter support: write color and grayscale movies (or just other raw data) in IDE (256 bytes per sector) or CompactFlash (512 bytes per sector) mode. It is the first patch that is 100% compatible with the MyIDE OS (tested with versions 3.x and 4.x). Of course, it also works with the stock Atari XL/XE OS. 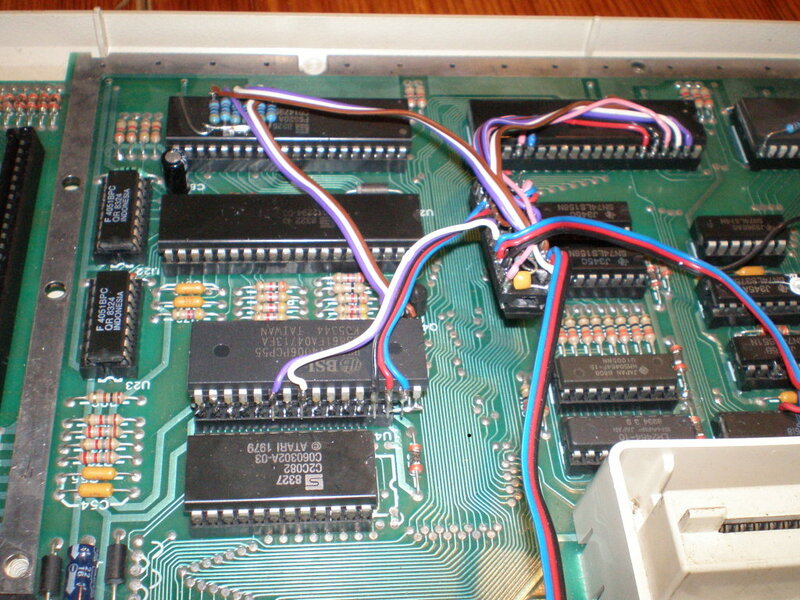 The package includes the full source code and a precompiled EXE (patchrom.exe) so that you can create a patched ROM file on your PC (and then, for example, program it into an EPROM). 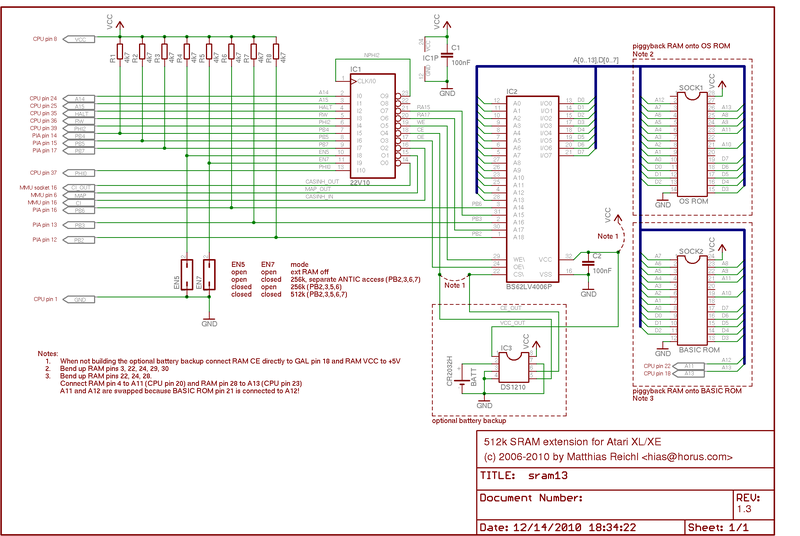 The main goals when designing this SRAM extension was that it should be cheap (less than 10-15 EUR), easy to build (you just need a 512k SRAM, a GAL 22V10 plus a few wires and resistors) and compatible with as many programs as possible. Optionally you can add battery back-up so that the contents of the RAM extension are preserved when you power off your Atari. If you are searching for a cheap GAL programmer, have a look at GALBlast. It's a DIY project and it's reported to work very well (but I haven't tried it myself, yet). 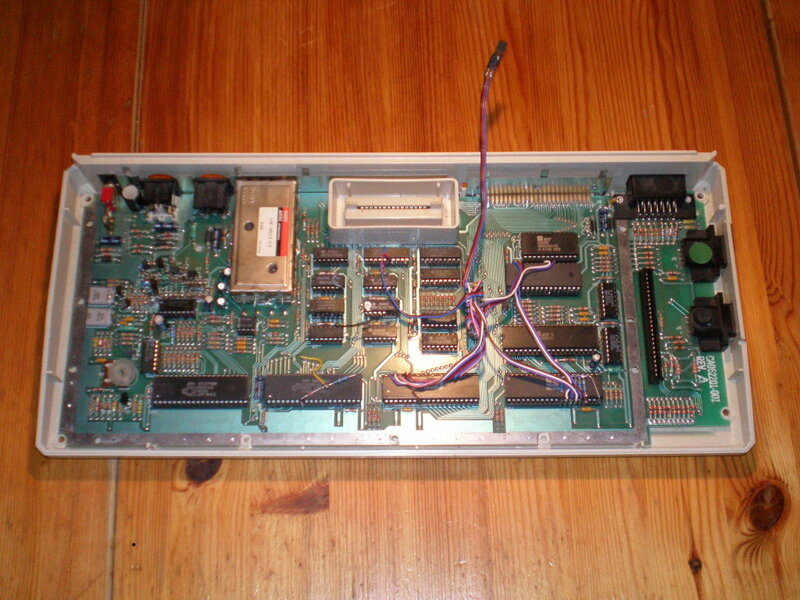 The original Turbo Freezer, developed in the end 1980ies by Bernhard Engl, was a very neat hardware device plugging into the PBI that allowed you to halt your computer any time, modify memory and to save or restore a complete snapshot to/from disk, extended RAM or cassette. It was a very valuable device both for developers and for gamers. Please note that there are a few minor errors in the schematics, the 00README.txt in the hardware directory contains an errata. This firmware update for the SDrive by Raster / C.P.U. fixes issues with the highest SIO speeds (POKEY divisor 3 and below). See src/ChangeLog.txt for a complete list of changes. The!Cart is a co-production between Wolfram "mega-hz" Fischer (original idea, PCB design and manufacturing), Peter "JAC!" Dell (PC software, nice entry selection on Atari) and me (CPLD logic, expert mode cartridge selection menu on Atari, flasher implementation and flash file format design). The source code and binaries for the CPLD logic, the flasher and expert menu are available here. The Mega Speedy is the ultimate floppy drive upgrade for your 1050. Out-of-the-box it supports the original 1050, Speedy, Super Speedy, a new Mega Speedy, 1050 Turbo and 1050 Duplicator modes. It can also emulate Happy 1050, US-Doubler, Super Archiver and Supermax modes but you need to provide the ROMs for these upgrades yourself. Mode selection is very easy, just use the rotary encoder and the display to choose the desired mode on powerup. You can also define up to 4 presets and use 1 or 2 optional switches to quickly select the presets. Or you can switch modes via a bootable menu on your Atari - just boot in Mega Speedy (or flasher) mode with the drive door open. Drive ROMs are stored in flash memory. For each mode you have 4 slots available so you can switch between different versions / revisions if you like. The flasher software can be booted directly from the Mega Speedy and it also supports uploading drive ROMs to RAM for quick testing or development of new ROMs. The Mega Speedy project was started by Wolfram Fischer, he did the initial PCB design and built the first prototype that could operate in original and Super Speedy mode. Later he handed over the project to Guus Assmann and me. I'd like to say a big thank you to Jim Patchell for making the 1050 Duplicator code available to the public and for allowing us to use it and to Steve Carden who did a lot of beta-testing and wrote the installation docs. Thank you! 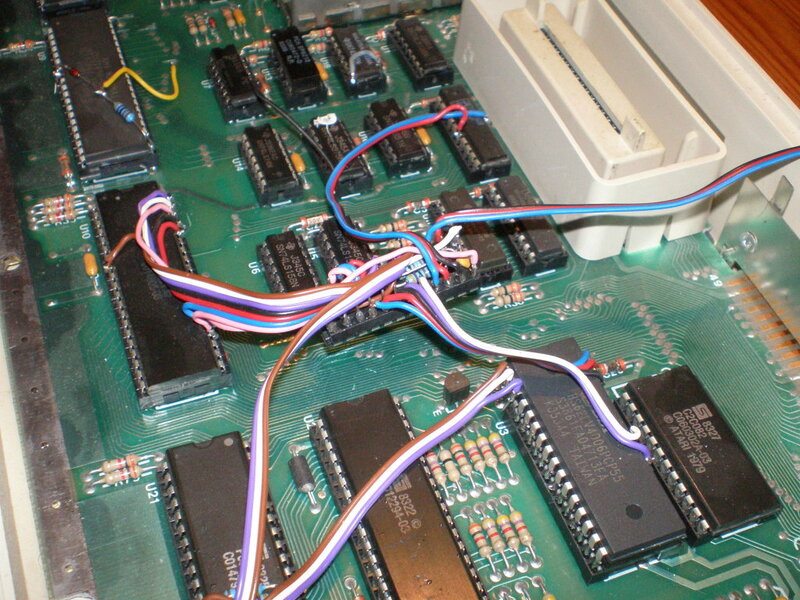 The source code and binaries for the CPLD logic, the flasher and config drive ROM and the schematics are available here: https://www.horus.com/~hias/megaspeedy/. General usage instructions and programming information is available in the README.txt inside the megaspeedy-software ZIP. Also check out Steve Carden's Mega Speedy webpage for installation instructions, pictures and more background information. If you have suggestions for future versions or problems with these programs, please send me an email.